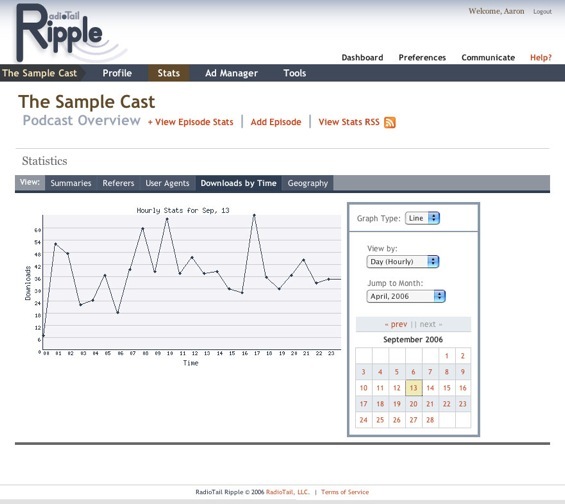 Podcasting stats and ads company RadioTail is announcing prior to this weekend’s Portable Media Expo in Ontario, California that they are now offering their podcast stat tracking service Ripple for free to any podcaster. The company hopes that podcasters using the free service will sign up to let RadioTail sell or serve ads for them. Publishers who don’t want to use their web based dyanmic ad serving features are free to use the analytics at no cost indefinitely. Advertising and thus analytics in online multimedia are on the front of many peoples’ minds right now, but the field is relatively young and still forming. While some companies are clearly going for the big corporate bucks, RadioTail has the look, feel and name of a populist stat tracking service made by podcasters for podcasters. The company was founded by Greg Galant, the man behind the Venture Voice podcast. Galant worked at both CNN.com and Newlight Venture Capital in a former life. His new company’s list of publishers and advertisers to date already includes BusinessWeek, Nikon, Palm, McGraw-Hill Construction and Microsoft. There are a number of podcasting stats services available, but RadioTail is doing some good things with Ripple. The service works through a simple redirect at the file download level, so publishers can change hosts at-will, track browser plays in addition to RSS enclosure downloads and doesn’t ask anything of listeners. Ripple’s statistics are updated once an hour, include the geographic location of listeners amongst many other details, are available in RSS format (very nice) and are displayed in HTML (not Flash like some competitors) for easy printing. The stat viewing dashboard offers an unusually long list of ways to have your data displayed and the company is actively working on increasing the technical usefulness of the data in addition to its direct ad selling potential. Unfortunately, export in spreadsheet formats falls into the company’s lists of features they intend to build but isn’t available now. Likewise, full vs. partial downloads aren’t tracked by the free Ripple service, though customers of RadioTail’s ad placement service are able to see what percentage of listeners played entire audio files. Other players in the podcast analytics space include Podbridge, which targets high end big publishers, Podtrac (similar to RadioTail but with a different feature set), hosting service Libsyn and RSS vendor FeedBurner. Thanks go to the guys at consultancy Feedia.net for insight on the key issues in this sector. Other announcements at this weekend’s Portable Media Expo were to include a rumored new round of funding for Adam Curry’s Podshow, but that story’s already broke. Podshow has raised $15 million more from as yet undisclosed investors, on top of $8 million from its A round. Some people are skeptical to say the least, but it’s evidence that other players are betting on a big podcasting economy. There’s still another very interesting announcement in the online audio advertising space that will come out next week. This growing economy will have a tail, it will need to be analyzed, and RadioTail’s free stats service is likely to work well for many podcast publishers.